The Youngstown State volleyball team got contributions from its entire lineup in a four-set victory over Robert Morris on Tuesday evening at Beeghly Center. The set scores were 25-19, 22-25, 25-22, 25-21. Five Penguins had at least eight kills, five players had aces, four players at least 10 digs and four had at least three blocks. Sam Brown, Aly Ryan and Lauren Thompson all finished with 12 kills, and YSU posted 13 more kills collectively than the Colonials. Brown had four aces, and Ryan had five blocks as both finished with a match-high 16 points. 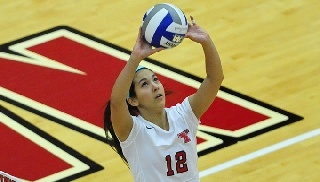 Youngstown State, which was playing its final non-conference match of the regular season, won for the second-straight decision and improved to 7-10 overall. A kill by Ryan started a six-point run in the first set that led to a 25-19 Penguins win, and Robert Morris did not trail in the second set despite a late charge by YSU. The Penguins trailed 21-14 and got within 23-22 before RMU took the final two points to even the match. The Penguins scored seven of the first nine points in the third set, but they had to hold off the Colonials late. RMU tied the set at 19 and again at 21 before YSU scored four of the final five points. Lori Vanbeek had two kills in that stretch for the Penguins. The fourth set was the closest of the match with eight ties and four lead changes. Neither team led by more than two points until YSU scored went up 18-15. The Penguins led 21-17, but Robert Morris scored the next three points to get within one. Ryan came up with a big solo block for the sideout, and YSU got an ace from Val Jeffery, a kill by Thompson and another ace by Sarah Varcolla to finish the win. Jeffery finished with 52 assists, 18 more than Robert Morris' setter, and Nikki Thompson tied for match-high honors with 19 digs. Vanbeek had three solo blocks, and YSU finished with 11 as a team. Youngstown State will play at Cleveland State on Friday at 7 p.m.